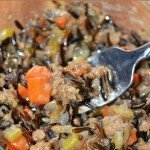 Wild rice gives this dish a firmer texture and lower carb count than the standard hamburger rice casseroles. I've been using wild rice more in cooking recently as part of my anti-candida, anti-psoriasis diet, and I enjoy it. Just be aware that it does take longer to cook than white or brown rice. Under-cooked wild rice is quite chewy, so make sure you allow enough cooking time. This dish can be made ahead and reheated on the stove top or in a crock pot. Just add a little extra liquid, if needed, to help with heat transfer and keep it from scorching. 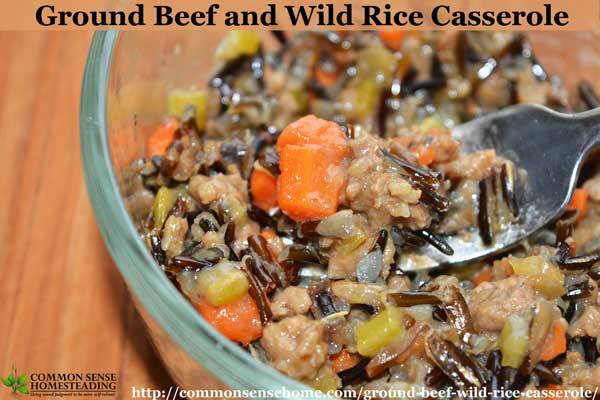 Ground beef and wild rice casserole is an easy, one pot meal that goes together quickly. Wild rice gives this dish a firmer texture and lower carb count. In a medium stock pot or Dutch oven, brown ground beef and onion together. Add rest of ingredients except soy sauce. Cover and simmer for about 1 hour. Add soy sauce before serving. In North America, the species, Zizania palustris, is found (primarily) in areas west and north of the Great Lakes. In addition, there are several other species that grow in limited quantities in other North American locations. Zizania aquatica is found growing in isolated pockets from New Jersey to Florida. And, Zizania texana is found growing in the San Marcos River area located just north of San Antonio, Texas. Also, the species, Zizania latifolia can be found growing in various regions of Asia. So, if you're into eating local, you may want to keep an eye out for the specific varieties that are native to your area. If you have a favorite way to use wild rice, I'd love to hear about it. Is the rice raw or cooked? This sounds real yummy. The wild rice goes in raw. Is there really supposed to only be 1 C water and 1 can soup for liquids? Im making it right now and did doesn’t seem like enough. 1 can of water, not one cup (so a little more than one cup). 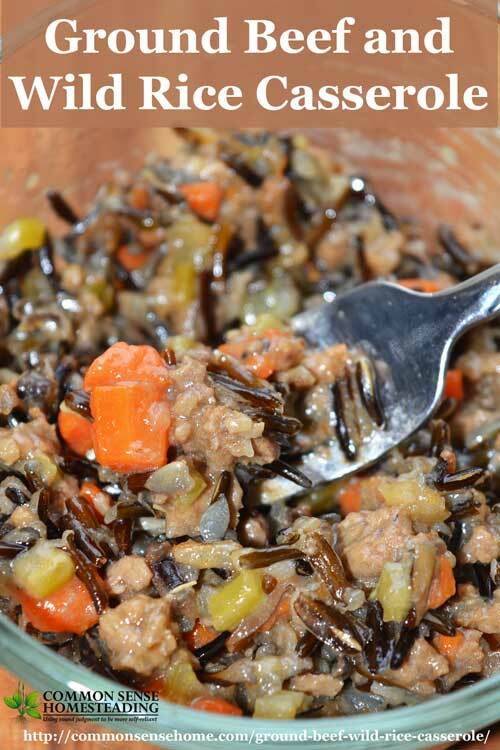 The wild rice doesn’t absorb as much liquid as white rice, and the carrots will add some moisture, too. The rice also absorbs liquid from the veggies in this recipe. do you drain the meat and onions after cooking? No, I didn’t. We use grass fed ground beef so it’s pretty lean. If you have fattier beef you could drain it if it looks too greasy. If you regularly eat siracha, then I could certainly see how you would desire a little more zip. I made this today…very good, and simple to prepare. Thanks for sharing. Glad that it worked well for you. Thanks for letting me know. I was worried that I wouldn’t be able to pull this off because I did not have a fresh onion or celery (yes it was one of those…”OMG, I have NOTHING in the house to make dinner” situations. Fortunately, I had a box of seasoned wild rice, and used that, which made up some of flavor deficit from not having the necessary veggies. It still turned out really yummy! My husband ate the heck out of this! What’s the nutritional info….specifically carbs per serving. How many servings does this make? I’m not exactly sure about the serving size, as the end product always turns out a little different depending on who is in the kitchen. (One person will add more onions, another more carrots, and so on.) It normally portions out to easily be a couple of scoops with my big serving spoon per person for the for of us, with enough leftover for a lighter meal the next day. I counted it as 12 servings, but I’m feeding young men. Also, there’s variation in the cream of mushroom soup. The nutrition calculator defaults to campbell’s brand, but I haven’t used that in years. If you want to try and calculate with whatever brand you use, there are programs available like My Fitness Pal. I do find that canned products tend to be more bland than fresh, so adding some extra spice of your choice would brighten the flavor.